Clover Honey in a 1 gallon container. 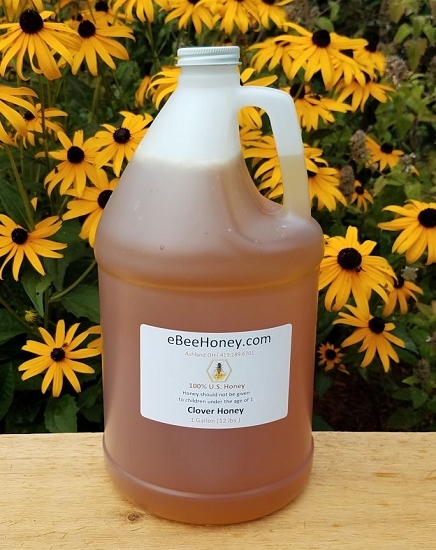 Clover honey in a 1 gallon container which is 12 pounds of honey. Clover honey has a pleasing, mild taste. Clovers contribute more to honey production in the United States than any other group of plants. The clover in our clover honey include white Dutch clover, white blossom clover, and yellow blossom clover. 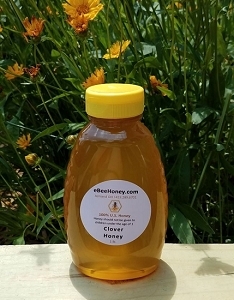 Clover honey has a sweet, flowery flavor and a pleasing mild taste. We've been very pleased with the clover honey. We use it daily for tea/coffee and in our protein/fruit smoothies and shakes. Excellent Honey. 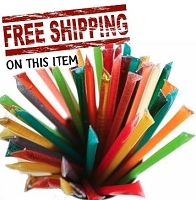 The Gallon Jugs are excellent and easy to store and handle. 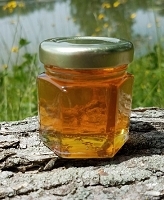 I purchased this honey to put in small, glass jars for a baby shower favor! The honey is so yummy and smooth. It looks so pretty in the little jars that we gave away (we had 6 oz. hexagonal jars and put a square of gingham checked material over it and tied it up with a jute stringed label and a tiny honey robber) they looked adorable!! I received phone calls from a couple of guests who had tried the honey and they both said it was delicious. 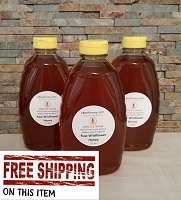 The service you provided was top-notch and I received the honey the day after I ordered it. Your website is easy to navigate and very pleasing to the eye. Will definitely be ordering in the future! Lovely flavor! We ordered 3 of the 12 lb gallons and it was so easy to pour into our jars and use them as wedding favors. Customer service was helpful and made sure I received it a certain amount of weeks before the wedding date to avoid crystallization. I have been getting my honey from EBee for quite a few years and it always been number one in my book. Will be ordering soon. This is a classic varietal for the tea drinker. Their product is a year around treat for my teas. I purchased a couple of gallons to make wedding shower favors. Made about 40 jelly jars of honey with "meant to be" tags for less than $5 each. Worked out beautifully! I ordered a a gallon of honey to make 5 gallons of mead. I had doubts about buying online, but scoring a gallon locally can be problematic. I was very pleasantly surprised by the quality of honey received. Just so very good! I look forward to sampling the mead several months from now. Clover honey by the gallon. I purchased 3 gallons of the clover honey for my wedding favors (we are infusing the honey with lavender). 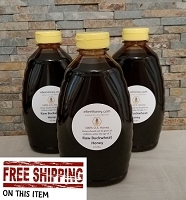 I had a time crunch and everywhere I looked seemed to have higher prices, so I contacted eBeeHoney to see how soon my order would come. I placed an order online, and received my shipment the next day. The man on the phone was extremely kind and helpful. But not only that,when we started infusing the honey, I sampled it raw, and it was amazing. So fresh that I could still taste the flavor from the honeycomb. 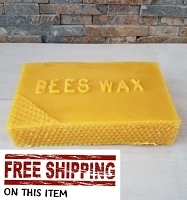 I would certainly order again from eBeeHoney. Good prices, good service, and fresh products!